I read the most unusual thing, about a giraffe. 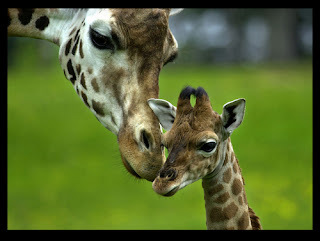 As a mother giraffe gives birth the first things to emerge are the baby giraffe’s front hooves and head. A few minutes later the plucky newborn is hurled forth, falls ten feet, and lands on its back. Within seconds, he rolls to an upright position with his legs tucked under his body. From this position he considers the world for the first time and shakes himself. The mother giraffe lowers her head and licks and nudges the newborn calf. She waits for about a minute, and then she does the most unreasonable thing. She swings her long leg and knocks her baby, so that it is sent sprawling head over heels. The struggle to rise is momentous. Finally, the calf stands for the first time on its wobbly legs, usually within 30 minutes of its birth. Then the mother giraffe does the most remarkable thing. She knocks it off its feet again. Why? She wants it to remember how it got up! In the wild, baby giraffes must be able to get up as quickly as possible to stay with the herd, where there is safety. Lions, hyenas, leopards, and wild hunting dogs all enjoy young giraffes, and they’d get it too, if the mother didn’t teach her calf to get up quickly and get on with it! Each of us feel at times like things are falling apart because of house maintenance problems, car repairs and personal issues that were strapping them financially and taxing them emotionally. But like the giraffe we need to learn to get back up. God is always there to keep us moving. Dear Lord we pray that we will have the strength to get up and keep going, knowing that you are there to encourage us. In Jesus’ name, Amen.